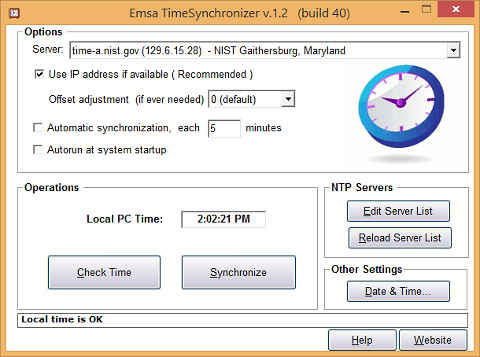 Emsa Time Synchronizer is an NTP Client for Windows. With this tool you can automatically synchronize computer time / PC clock using an NTP server (Internet Time Server). This program can be configured to start with Windows and continuously update time in backround. Lightweight, small size program, reliable and easy to use. - 'Check' button checks local PC time and informs the user if the local time is accurate or not. - The 'Synchronize' button synchronizes local time with the NTP server/internet time server. Server: Choose NTP server to use. In order to avoid delays, it is best to choose a server closest to your geographical location. Use IP address if available:Always use the IP instead of the host name, as the IP-based process is faster and more accurate. Offset adjustment (rare): One-hour offset feature that has been requested by our users. Through the program interface, an offset of up to +/- 60 minutes can be set. Autorun at startup: When logging into Windows, the program automatically starts as an icon into the system tray. Edit server list: Edit NTP server list and add your own. (opens a file called ntp_servers.txt, available in program's chosen installation directory). Save the file after edit. Use Notepad or any other text tool to edit this file. Reload server list: Reload server list after saving. You must select a new NTP server afterward, then do a Check and Synchronize to make sure it works. Date and Time: This is a convenient feature that simplys open the Windows Date and Time settings applet. - When peforming manual Check or Synchronize operations, please do not perform fast, repeated requests of this kind. NTP servers will implement as an attempt to overload them, any repeated requests within just a few seconds time. To be safe, please allow 10 seconds or more between retries. Otherwise your IP might be blocked by the time server. - If you want the program to start when computer boots up, configure Windows to automatically log without a password. In the future we might also implement a service mode that starts even if user is not logged into Windows, but so far no user has requested it. (If you need this feature, please let us know). Our program is a lightweight one, with very low CPU and memory usage. It runs virtually on all Windows operating systems from XP and above, and even on some older systems as well. This program is provided as an installer executable. To install, follow the wizard instructions carefully. To uninstall, use the Add/Remove programs feature in Control Panel. If you have suggestions, bugs notices, requests for new features, please contact us. Thanks! Any usual Windows machine with will do. There are no special requirements. Please read the license.txt file for licensing information.